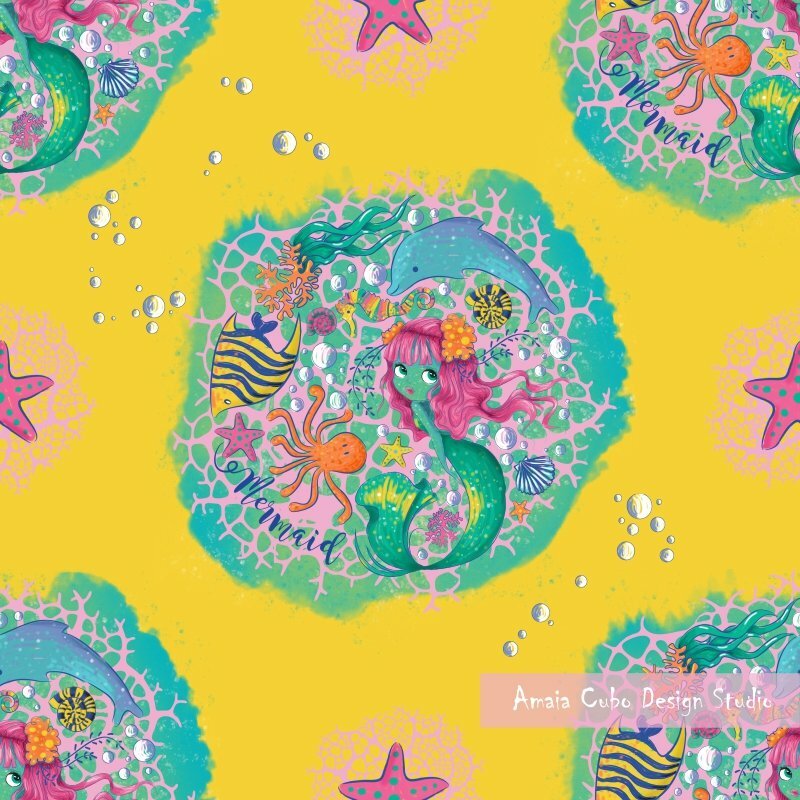 Today I bring you a refreshing print under the sea! Sea creatures are my fetish theme for summer prints. They are irresistible! You can make a two-color printing, such as the SEA pattern last week. Monochromatic looking like scientific illustration. O with much color tones emulating tropical fish. It is drawn with digital watercolor to find a watery texture. So if you decide to change the background, choose a more or less clear color, as many of the layers have a low degree of opacity and shows through a little background. This time I have uploaded two totally different outfits to show you graphically how we can take a print to different styles with minor variations. TIP: I’ve given this a line of beach camisole. To be more all-terrain and not be just a sport aspect, I have added a ruffle from shoulder to hem. Take note, you are going to see a lot this line for spring-summer 2019. I love it! TIP: Do you prefer a more classic look and lower the colors? Then this second set is your choice. I have used the pattern changing the yellow background by bold stripes (another must for summer 2019) light blue and white-off. The skirt is high waisted and with long gathering. I have combined it with a fuchsia crop-top of raglan sleeve. The narrow fuchsia belt closes look. Use leather for the classic style and PVC to give a more contemporary feel. Although I have not shown the back of the top, I think it would look great with a big neck “U” as a ballet leotard. Also with bow or button on the back. Is not this a sweet and modern set at once? As you can separate the layers and isolate elements, it would be a good idea to use the main part of the pattern where the siren and used as print for a top dress or shirt. As always, I mean, you will find every element of the files separately, can change the background, algae repaint or change the layout. This colorful and refreshing print under the sea is waiting for you at the shop, so … Get him!